A Scout is trained to survey and survive, gathering all of the information he can while keeping his head attached to his body. Fearless, he must be willing to touch down on a completely unknown planet and trudge about with only scanners and his wits to discover it secrets. 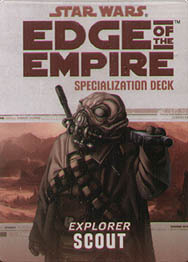 This deck requires the Edge of the Empire Core Rulebook and includes cards for all 20 talents available in the Scout specialization.